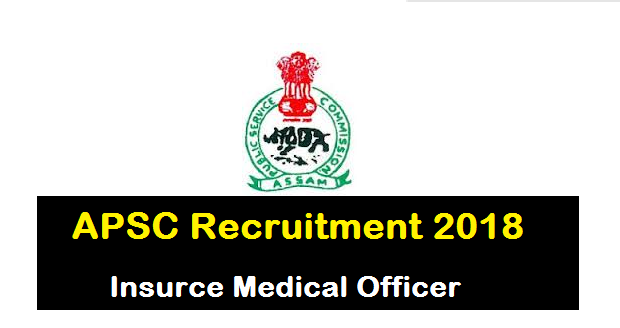 APSC medical officer recruitment 2018 for insurance : Hello my dear Job aspirants. Welcome to Assam Career Job Portal. Recently another government notification is out and in this article we will be presenting you about the recruitment. Assam Public Service Commission (APSC), which is a controversial board among the recent years has issued a Job notification for the post of Insurance Medical Officer. According to the latest official APSC notification 2018, Assam Public Service Commission (APSC) invites application from Indian Citizens as defined in Articles 5 to 8 of the Constitution of India for the posts of Insurance Medical Officer under Assam Government in the scale of pay as indicated below and carrying usual allowances as admissible under Rules of the Govt. of Assam. Following are the details of the post under APSC recruitment 2018 with required qualification, age limit, salary and all. We urge you to look at the following details of the posts under APSC recruitment of the month of June 2018. (ii)By 3 years for OBC/MOBC candidates i.e upto 41 years.|(iii) For Persons with Disabilities (PWD) by 10 years irrespective of SC/ST/OBC and General Category of candidates. Educational Qualification: Applicant’s Minimum qualification should be MBBS having Registration under Assam Medical Council, 1960. Application Fee: Fees should be deposited only through Treasury Challan in the Head of Account “NON TAX REVENUE, OTHER NON TAX REVENUE 0051 PSC, 105 STATE PSC APPLICATION FEE RECEIPT OF APSC” showing name of post and department. Original copy of Treasury Challan should be submitted along with the application form. 3. Candidates having BPL Certificate: Nil (Candidate having BPL certificate should produce their photocopy of certificate along with the Application Form). The name of the post applied for should be clearly written in “bold letters” in the Envelope containing the application form and it should be addressed to the Deputy Secretary, APSC, Jawaharnagar, Khanapara, Guwahati-781022. Application form may be obtained by downloading the same from the APSC’s website www.apsc.nic.in ( Application form DR). The last date of receiving duly filled up application form in the Commission’s office is fixed on 09/07/2018 during office hours for APSC medical officer recruitment 2018 for insurance.